(1) Unifactor or Monarchic Theory—It has been called one factor theory. The followers of this theory are Binet, Terman and Stern. According to it, intelligence is a unit and entire intelligence does only one type of work at one time when active. According to this theory intelligence is the most powerful mental power, which dominates all mental abilities. But this theory is considered faulty, because we cannot say if a person is good in Mathematics, he will be good in arts as well. (2) The Two Factor Theory—the follower of this theory is psychologist, Spearman. According to this theory, there are two factors of intelligence, means intelligence can be divided between two parts. According to Spearman, intelligence is the addition of two kinds of strengths. General ability helps a man in all kinds of activities and special ability helps in doing some special work. As-one is intelligent in music or art and other in Maths or Science. For the skillfulness in special activities, ‘S’ factor is needed. General factor of intelligence has following characteristic—(1) it is found in all the factors. (2) It is innate. (3) This factor is always equal. (4) There is difference in the general ability of every person. (5) The man who has this factor more, he gets more success than other person. (6) This factor is more needed in all works of life. These are Characteristic of Special Factor of Intelligence—(1) this factor is found in different people in less or more quantity. (2) Different kinds of special factor are determined for different activities. (3) the person who has more quantity of any special factor, he gets more ability in that. (4) Special factor can be acquired. (5) Different persons have different kinds of special factors. (3) Three Factor Theory—In this theory, Spearman added collective factor with ‘G’ and ‘S’ factors of intelligence. 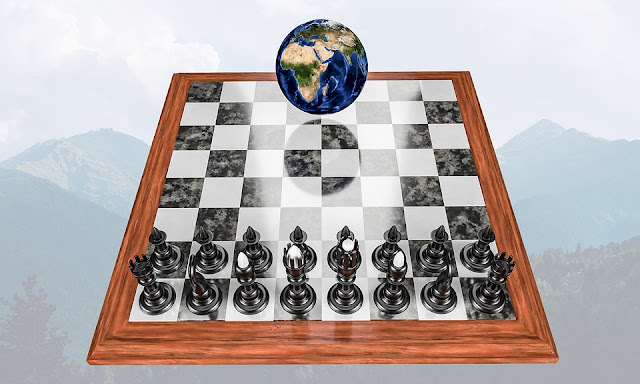 According to it, three factors are needed in the intelligence test- general intelligence, special intelligence and language and spatial knowledge. This theory is in controversy. Psychologists have expressed their difference of opinions in this theory. So this theory cannot be all accepted. (6) Group Factor or Oligarchic Theory—The follower of this theory is G. Thomson, the famous psychologist of Scotland. According to him, there is a group or collection of special abilities. There is equality among the same abilities of a group or collection, as-under the collection of the literature abilities there will be a close relation among poem, story, and fiction and essay, but these abilities will have no relationship with the abilities of the collection of science. (7) Hierarchical Theory—The follower of this theory is Burt and Vernon. They have given hierarchical theory to the mental abilities. And they have told the four following mental abilities. Fluid Intelligence—Cathal has called it GE factor. The effect of heredity falls on the development of fluid intelligence. So, due to the different reason and heredity related changes, there is difference in the intelligence of different persons. The development of the crystallized intelligence is affected by the environment. Therefore, due to the environmental differences or similarities, equality or inequality can be seen in the intelligence of difference persons. According to Cathal, after philosophical analysis, the above two factors they can be divided among many factors. Cathal has constructed ‘Culture Free Test for the measuring the intelligence’. Bywhich fluid intelligence is measured. (9) Unified Theory—Guilford has delivered the unified theory. 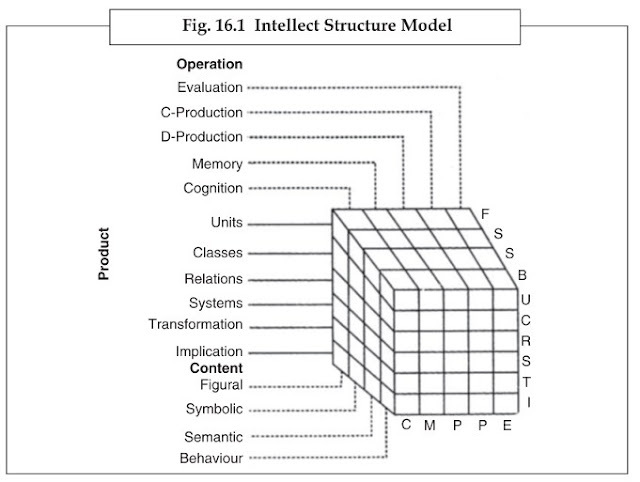 According to Guilford, intelligence is a ‘’structure of intellect Model’’. There are three parts of structured model which includes different abilities. Cognition—on the basis of this ability a man remembers any thing again. Repeat it and try to recognize it. Memory—on the basis of this ability a man, on the basis of his previous experiences, establishes relationship with the present. He remembers his previous experiences and remembers them carefully. Divergent thinking—on the basis of this ability, a man uses his intelligence in the many dimensions. He can think about different dimensions, can take decision according to the situation. His thinking is not one sided. Convergent thinking—convergent thinking is the other side of divergent thinking. Both types of thinking are important in the life of a man. With this type of thinking, a man becomes capable in a way that he finds out correct solution for any problem at last. Evaluation—on the basis of this ability, a man lives in whichever atmosphere or doing work on whichever problem, he tries to keep all information about them. Then, after analyzing the entire situation he reaches out to the correct decision by the proper method. Figure—It means that a man tries to understand and recognize some special figure after watching it. He does this work with the help of his sense organs. And inspect the figure thoroughly in a proper way. Symbolic—It means that after understanding the different symbols in proper way, a man can use them according to the importance in his life. It is needed to understand the different kinds of symbols to do different kinds of work in life. Language—Language related ability is considered important to succeed in life. In the condition of having good command over language, a man can convey his own thoughts to others very well and understand others’ thought very well. Even the nature of thoughts can also be easily perceived. Behavioral—It means social intelligence, which helps a man in the understanding of different human communications easily. It has been considered as the most important stage of life. Units—It is important to understand the meaning and knowledge of seeing, hearing and symbolic units. Means, here a man tries to understand the uniqueness and characteristics of sensory perceptions. Class and Category—Under it, the ability of the classification of the units come. It is seen in it that a man can put thoughts in category or not. Relation—Under it, it is observed that a man can understand the relationship among different things, or not, along with this whether he can explain this relationship or not. Systems—According to it, providing the arranging the nature of different kinds of thoughts and problems and finding out their solution etc are included. Transformations—It is related to that type of ability in which a man can learn of the nature of particular thing after making a specific change, or to advice which change will be able to bring about the specific form. Implications—it means that the man has the sufficient ability to understand the contained meaning in the thought, things and facts. So some people use implication as the contained meaning. Guilford’s above descriptive theory is one of the best extended theories. Yet the assumption of Guilford states that this model is quite theoretical and changes can be done in it. The most important thing is that it gives birth to new possibilities in the scientific field. This theory of Guilford can be understood in short in the following way, that, intelligence is a logical structure which is made of two main things-memory and rumination. The classification of the rumination has been done under cognition, product and evaluation. Product has been divided between two classes-divergent thinking and convergent thinking. Thus, in total there is a collection of five intelligence parts, which has been cleared by the medium of some processes. The classification of five collections has been done on the basis of two theories. Under it whichever types of outcomes (units, classes) are included and the types of content (figure, language, symbolic and practical) that have been taken, in this connection Guilford ends his theory, stating, that the blank cells indicate towards those primary mental abilities, whose discovery still remains. 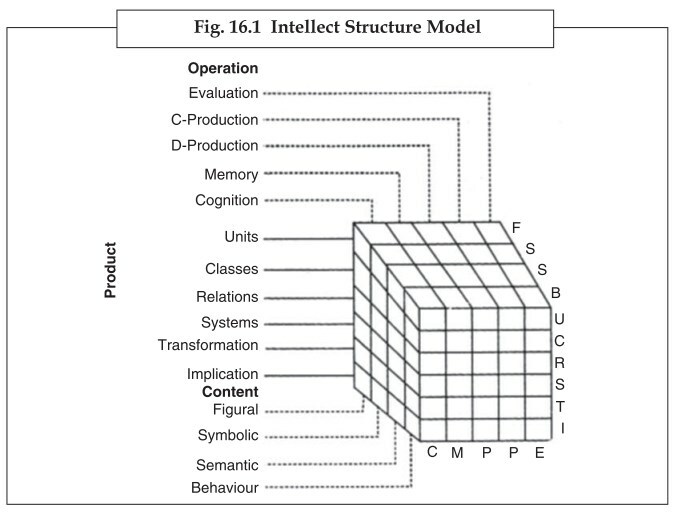 Its long factors—Guilford presented a model of the shape of box, on the basis of scientific analysis in 1967, which is known by the name of Intellect Structure Model. He made cubes of 5 × 4 × 6 in this model, means total 120 cells, in which different factors depending on the three factors related to mental ability have been put. Minimum one factor or ability has been kept in each cell, in some cells, factors more than one can be put. There is no arrangement of it. Guilford has described each factor in three dimensions and on the basis of his factor analyzing research; he has got success in establishing the existence of 80 factors, and was hopeful for the remainder. Guilford has divided all the factors of intelligence in this way. As far as the question of the implication of this theory in the educational field, Guilford had told during the time of delivering this theory that this theory will give birth to new possibilities in the field of education and in the field of research. Guilford had this belief that this theory would provide a new nature to the entire educational learning process. He has compared learner to computer. Difference between them is so that student determines his program himself, while computer depends on others. Intelligence affects the mental ability of a child. What is intelligence? The answers to this question have been given by the psychologists as per their opinions. Psychologist have explained the nature of intelligence with the help of various definitions, and their conclusion is, that, intelligence is a general ability. It is a collection of different abilities and the essence of special ability. Psychologists have accepted the following theories about the organization of intelligence.